Huh? Interest Bearing Fractional Reserve Money by Fiat... Doh! Prologue: Why the Don Quixote, Nate? I know… I know… friends and family think I’ve gone off the deep end – again. They thought the same thing when I began selling my rental properties, pulled my money out of my 401k and out of stocks entirely. They literally said I was nuts to sell my “million plus” dollar home, and they couldn’t believe that I wrote and published a book on the subject and that I spend my own money and time trying to educate others. And here I am banging away on the keyboard, four years after I began that campaign. Now people don’t think I’m so nuts, they have seen the events that I described unfold. We have all learned a great deal we did not know, and that includes me. Still, I think I see where this is going, and my goal here is to get people thinking about the root causes of the problems so that we can work on a better way forward. Dismiss this thinking if you will, but remember that what was thought of as “nutty” just a short year ago is now mainstream. What will you be thinking when we reach the bottom of wave C? We the PEOPLE, in order to form a more perfect union, say that it’s time to Cut the Crap, there’s simply no more time to waste. This past Friday we learned that another 533,000 real people, not numbers, are losing their jobs, their houses, and their future security! Over what, a screwed up medium of exchange? A method of exchange that was forced upon the PEOPLE who never got a say in the construction of that system! WHO does the system serve? Is that same old tattered system going to work for the PEOPLE going forward? Is there a better way? YES, WE CAN develop a better way! A better system is one that does not SHACKLE. A better system is one that embraces FREEDOM and promotes progress for mankind. Yes, WE can. “THEY” cannot. It’s time for action, but that action cannot be unfocused. We have a little more history to understand about our system first, and then we can work to implement a plan of ACTION. Action is necessary because our economy has run into a little problem – the MATH NO LONGER WORKS! The MATH is speaking loud and clear – http://http://economicedge.blogspot.com/2008/11/death-by-numbers.html. Yet, the fact that the math no longer works is just a symptom of the greater disease… If I may mix my metaphors; math is the forest which itself is made up of trees, but it is not the ROOT cause. To understand the root cause, we must dig down deep to the very construct of our economic and political systems. I just heard President Bush say that “they” are working on the ROOTS of the problem. NO, they are not. They have yet to identify the roots. They are talking about trees, not the forest, not the roots. The roots are found by examining the history of our monetary system and the basis of our economy which can be found in our own Constitution which, you will see is being IGNORED. 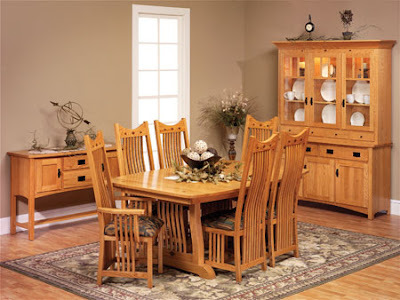 - To borrow money on the credit on the United States. - To regulate Commerce with foreign Nations, and among the several States, and with the Indian Tribes. - To coin MONEY, regulate the value thereof, and of foreign coin, and fix the standards of weights and measures. - To provide for Punishment of counterfeiting the securities and current coin of the United States. - To declare war, grant letters of marque and reprisal, and make rules concerning captures on land and waters. - To make all laws which shall be necessary and proper for carrying into execution the foregoing powers and all other powers vested by this Constitution in the Government of the United States or in any Department or Office thereof. A balanced review and viewpoint on the subject of money and our Constitution can be found here: http://http://www.gold-eagle.com/editorials_03/holloway021003.html. At the top of the page are a couple more links to articles on the constitutionality of money – it’s worth your time. Please go back and re-read those powers that belong to CONGRESS. Our system has become so distorted by “legal precedent” that I just don’t see that Congress is fulfilling their role and have allowed other branches of government to usurp the power that rightfully belongs to them. I believe there’s a reason for that; the wealth of this country is controlled by the central bankers and corporate interests whose money now influences every step and every decision in the lawmaking process. The original intent for the development of corporations was to encourage risk taking by old world exploration companies. When Spain and England, along with other European countries wanted to explore the new world, they were having trouble financing those expeditions due to the liability involved with shipwrecks. If a ship was lost, not only did the company lose their investment, but they were open to lawsuits from investors and survivor’s families. Thus, the intent of a corporation is to promote exploration and risk taking for the advancement of society (or to steal other’s riches?). In any event, this corporate “protection,” or limited liability has been completely convoluted in modern times. The wealth within those corporations is now used to influence the election of public officials. They are so brazen that they now WRITE THE LAWS that they simply hand over to “their” politicians for them to implement on their behalf! Where do you think multi-hundred page bailout documents come from? Do you think Paulson sits down in his office and types them out in an evening? Well, one of them he did – but it was only one page long! How did the latest bankruptcy “reform” come to pass? It certainly wasn’t for the good or protection of the people for whom it is now much more difficult to discharge unsecured debt through the bankruptcy process (can’t default)! And, as it turned out, the unintended consequences proved to be not so helpful for the corporations who sponsored it, because now, instead of defaulting on their unsecured debt, people are simply walking away from their secured debt and letting the banks eat it (but the banks are not defaulting either, they are passing it on to all of us)! Thus, this entire system is broken, and is at the root cause of the problems. It is this phrase that people who back the gold standard refer to when they say that our Constitution set forth the gold standard. This and the power of Congress to tax have been the subject of much debate, including legally. Guess who gets appointed to those positions that make the legal rulings? This IS AN IMPORTANT POINT THAT I WILL NOT GLOSS OVER. The same money that is used to elect our politicians also is influential in the appointment of our judicial system because those same bought and paid for politicians appoint and confirm the judges. Thus our system of government has become completely controlled by our economic system and our system of money. Our current system has, in fact, evolved to be a system OF THE CORPORATION, FOR THE CORPORATION. There is a better way, but first we need to understand the current way a little better. Our current money is an interest bearing, fractional reserve, by fiat system. Huh? Look, I’m not going to kid you here, this stuff is pretty dry, but please follow along because these are the ROOTS we’re talking about here! Of course, this conversation we’re having here assumes a little bit of prior knowledge, right? Like everyone knows what a barter system is. And most people know that money is simply a method of exchange so that the fruit of our individual labors can be traded for the productive outcome of other people’s labors. And we know that that medium of exchange can be anything we want it to be; Wampum, sea shells, gold, or even pieces of paper. This means that all money when it is issued is debt. “Huh?” again you say. Yep, when you went and got that loan for your house or for your car, where do you think the “money” came from? Did the bank already have that money? Did they have to in-turn borrow it from somewhere else? NO, and NO! When they cut that check to pay for your house, that money came out of thin air. That’s where most money comes from! Attached to money is a obligation by the borrower to pay INTEREST. For the privilege of receiving this loan, the borrower also got to pay FEES to pay for the loan (thus paying twice). And, just like the money that is borrowed into existence, when the TREASURY wants to increase the supply of money, they issue (sell) treasuries (debt) to people who expect to receive payment for the “loan” in the form of interest (that comes from taxpayers who must earn it as the reward for their labors). In order for the Treasury to literally “print” Federal Reserve Notes (FRNs), they theoretically need to first issue Treasury debt. Thus, all money is debt, and all money when created carries interest with it. Huh? You say… and so do I! If our money is a system of exchange where my labor is converted into FRNs (Federal Reserve Notes/paper money), and your labor is converted into FRNs, so that we can both exchange our labor with others, why does all our money have to carry interest? Simple question and the simple answer is that it DOESN’T. 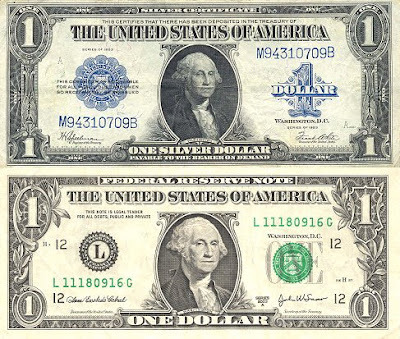 Notice in the picture below that the current bill says at the top, “Federal Reserve Note.” That phrase is not found on money backed by gold or silver (no, I am not a gold bug!). For decades in the modern era of our country, our financial system represented about 15% of the earnings within the S&P 500. That shot up in recent years to more than double that! Fees and interest on everything! Derivatives of all sorts were created and HUGE fees and “profits” were made. Our financial “services” industry became the backbone of our economy and also became our largest export. Stimulate… market… transact… expand the credit – fees & interest. Stimulate… market… transact… expand the credit – fees & interest. Stimulate… market… transact… expand the credit – fees & interest. Stimulate… market… transact… expand the credit – fees & interest. Over and over – ad nauseam. With each transaction fee and each interest payment, the financial industry pulls a piece of the value of that dollar with it. Without increasing the money supply (inflation), their pulling of fees and interest would eventually grind the money to zero – it would all wind up in the hands of bankers (a deflationary tendancy). So they ensure more and more, inflate or die. Inflation, THEY say, is good. Yes, inflation is good, IF you are a banker… who happens to earn interest and fees on money they create from nothing. So, while others are exchanging the fruits of their labors, BANKERS are issuing loans denominated in FRNs they never possessed and collecting interest AND fees on every transaction. Doh! She bounced through Wonderland like a bunny, “CDO, MBS, I may not have the money! But I’ll sell you a CDS; now that would be funny!” And thus, Alice charged fees, commissions, and interest all the while taking bonuses to pay for her Ferrari – in Wonderland. And lower they did, all the way to ZIRP (Zero Interest Rate Policy)! And yet the people of Wonderland still could not pay. What to do to save the day? And when loans against MBS failed to get Wonderland going, Hank is caught in a conundrum, “We’re out of bullets, out of bullets, what to do? Only in Wonderland… where the rules of physics, math, and real economics are rejected! Meanwhile, back in the real world, we know that the rules set forth in the interest bearing universe still apply. So, let’s HAMMER one point home here; All DEBT in an interest bearing system must be repaid WITH INTEREST in one way or the other. There are TWO ways, and only TWO ways to pay it back. One is to simply return the money over time (with interest), and the other is to DEFAULT. IT IS A MYTH THAT YOU CAN “INFLATE” DEBT AWAY. To create inflation you must create more money than there was before. Since we learned that all money is debt, the issuance of new debt to inflate only causes more debt. Do you see where this is heading? Ben Bernanke does. Thus, he figures that if he can create money that doesn’t bear debt then he would be breaking that circle and thus causing inflation – quantitative easing – which he is doing by “buying” our own debts! Gee, perhaps if I issue myself a loan I can go buy a new car with it! And THAT would be defying math and economics in the same way that jumping off your roof while flapping your arms to fly only works in Wonderland! The result of attempting to inflate debt away is that the debt simply gets repaid (with interest) in OTHER WAYS. The primary “other way” is that the purchasing power of the currency you hold and future currency that you gain as the result of the fruits of your labors are diminished. Government officials and the bankers who created this system prefer this method over default, because it spreads the payback, and for awhile at least, prevents people from breaking into their offices and dragging them out into the streets (for which America does have precedence)! And thus what you are now seeing is a huge push TO SOCIALIZE THE LOSSES, and yet in good times the push it to PRIVATIZE THE PROFITS. Gee, that’s a great system, how do I get to be a central banker… in Wonderland? In summary, since all money is debt, and all debt carries interest which the banking system skims, the interest bearing function slowly transfers the wealth into the hands of the banks. By the way, NO fiat system has ever failed because of recession, depression, or deflation. Those are the forces that wring out misallocations and keep the math working longer! Attempts to prevent them ACCELERATE inflation which compounds upon itself leading to ever larger misallocations. And misallocations are no laughing matter. People spend their time and energy working to help society, they think and hope, but when those energies, those labors, are misallocated, well, as a society we are simply wasting time and resources. Have I lost you yet? Heavy stuff, I know, I hope Alice made it lighter, our future’s looking brighter! Now we get to “lever” it up… in Wonderland. As paper money evolved, bankers began by exchanging gold for paper. Thus, banks were originally used to keep your gold safe, and in exchange they gave you a piece of paper that was your “claim” to redeem that gold at the time of your choosing. It was during this phase that bankers figured out that they could write more pieces of paper than they possessed in actual gold! Uh, huh, IN EFFECT THEY WERE COUNTERFEITING a false currency. They got away with it as long as not everyone came and claimed their gold at once! They held a “fraction” of the gold in reserve, thus “fractional reserve” system. This fractional reserve ability effectively multiplied the supply of available money. This increases leverage and is the root cause of monetary inflation. The reserve requirement started at 50%, eventually became 10%, recently hit zero and now is negative! Thus every step in that process the money supply was inflated (devalued) while leverage increased. Remember, that those who possess and control the currency generally have the most influence over politicians and thus springs the golden rule: THOSE WHO HAVE THE GOLD MAKE THE RULES! Said another way, this ability to issue more paper than gold was a cool trick. But then growth began to slow… and thus more leverage was needed to keep the never ending series of larger numbers growing. Not only was the reserve requirement relaxed, it was just recently completely suspended! TO ZERO! NO WAIT, not zero, NEGATIVE. What is the leverage with negative reserves? IT IS INFINITE! And, that is indeed a cool trick AS LONG AS BORROWERS STILL HAVE THE CAPACITY TO BORROW AND THEN PAY IT BACK! If they don’t, well, end of the growth line. DING, DING! Is that the sound of light bulbs coming on? Want to see a chart? I know… I’m a visual person too, I like charts, especially when our own government is nice enough to make such pretty ones! Whoops! Is that a cliff dive I see? 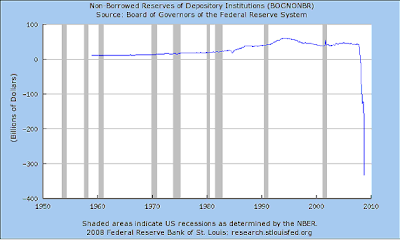 Please examine the title of that chart; Non-Borrowed Reserves of BANKS. Hummm, non-borrowed reserves… note that it has always been a positive number until now, but what does that mean? It means this chart is showing the amount of reserves held by the banks that is NOT borrowed! Borrowed from whom? I thought banks did the lending?? Borrowed from the Treasury, that’s the taxpayer, you and me! You see, in order to keep operating the banks have been exchanging their BAD securitized debt assets for money from our treasury – borrowing their reserves. In effect they are passing their debts onto the taxpayer, but promising to pay them back at some future time (which will never come). And this ability to NOT even hold reserves, but to borrow them, increases the banks’ leverage ability exponentially, AS LONG AS THERE ARE WILLING AND CAPABLE BORROWERS. Now, I know this sounds silly, BUT can you imagine our government taxing its citizens and then PAYING the bankers interest for any reserves that they hold? Ha, ha, I KNOW that’s just too Alice in Wonderland to even imagine, RIGHT? Ha, ha, would you believe that we just began doing that? Uh, huh, so now there is NO reserve requirement, AND if they do hold reserves, we pay ‘em for it! Niiice work if YOU can get it! But wait, it’s even more ridiculous than that! You see banks created those new fangled securitization of debt products (derivatives of debt) and sold them throughout the globe completely without any regulation or monitoring whatsoever! That “SHADOW BANKING SYSTEM” grew to be many times the size of the banking system tracked and “regulated” by our government. Remember who writes those rules? Uh, huh. At any rate, all of this is just FLUFF. It matters NOT, because THE MATH involved in fractional lending has reached its end. The current debts can no longer be serviced. THIS LEFT OUR POLITICIANS AND CENTRAL BANKERS WITH TWO CHOICES. They could let the bankers DEFAULT on their debts, or they could pass those debts onto the taxpayer. We all know which route they chose! While we’re on the subject of reserves and leverage, every one reading this knows that J.P. Morgan (JPM) is the largest holder of derivatives in the world and thus one of the most highly levered, right? They are a lynchpin in the derivatives world. Keep your eye on them; you will know the system is in trouble when they are no longer able to keep up the façade. They are the key domino, that’s why they got government backing to buy (and hide) the “assets” of Bear Stearns and Washington Mutual. Fiat literally means BY DECREE, usually by the KING. I’m not going to get into the alternatives or debate them here, but history does show that fiat monetary systems which have no intrinsic backing have ALWAYS FAILED. In the United States our money was not always fiat. In fact, we have been on, off, and partially on the gold standard at different times. Our latest sojourn from the gold standard began with the signing of the Bretton Woods Accord in 1944 which devalued gold and set the foundation for the IMF (International Monetary Fund [American Central Bankers]) and our current currency system. The gold standard was entirely abandoned in 1971 by President Nixon in response to worsening economic conditions. Thus, this fiat monetary EXPERIMENT actually is only 37 years old. If you refer back to all the parabolic debt charts in my article Death by Numbers, you will find that the parabolic phase began not too long after we became pure fiat. Now, I’m not saying that some form of fiat couldn’t work. In fact, you may be shocked to learn that I believe a workable and sustainable fiat system can be developed. I’m going to let you in on my thinking, but not today. We still have a little development to get to the point at which you may accept my ideas. What is clear to me is this: The math doesn’t work, the money and political systems are now so intertwined that they are practically one in the same. All the “experts” and politicians are still talking about the trees. It’s time that we CUT THE CRAP, let’s get to the roots so that we can really fix the problems for the long haul! If WE, the people, don’t – some central banker surely will!